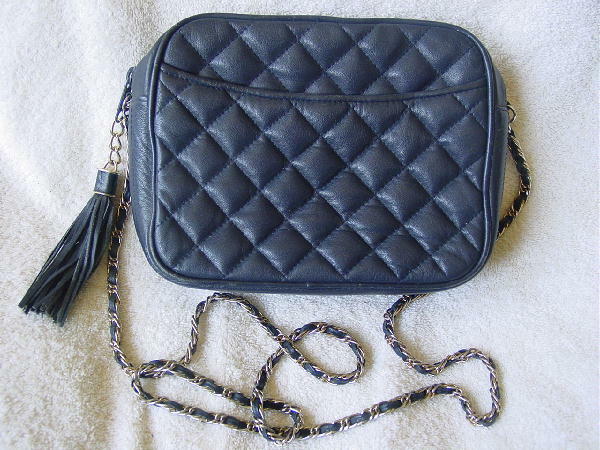 This vintage blue leather purse has a quilted front and back with a compartment in the front which has a hidden magnetic closure. The top has a side to side zipper with a gold-tone chain and a thin leather strip 4 1/4" long tassel. It has a blue faux leather interior and a deep zipper pocket. There is a 52" long gold-tone metal chain with leather woven between the links. It's from a stylist's inventory, and was used in a movie.